This book tells the story of more than 10.000 American boys buried at the military cemetery in Margraten, a small village in the Southern part of the Netherlands, and their Dutch adopters. Stories about the suffering during Nazi occupation, about life, struggle and death of the young American liberators, about the memories and sorrow of their families in the USA. Also a story of many loyal adopters who commemorated end prayed for “their” boys all those years. A story how a small village refused to forget their American friends. Anyone interested in WWII should read this book. This book can be ordered for € 22,50 forwarding-charges not included. You can order the book by clicking on webshop at the bottom of this page. Summer 2013. The parents of filmmaker Jotja Bessems meet the family of the soldier whose grave they adopted for the first time. This event is the basis for a modest, emotional and sometimes comical portrait of 70 years of adoption and solidarity. Hub and Nel Bessems, Jotjas’ parents, bring flowers at the grave of Sidney Stuart Beck a couple of times a year. In this documentary we follow the Dutch and the American family since they first met at the American cemetery. The 83-year old Gerda Roebroeks-Nelissen is dreaming for over 70 years to meet family members of her adopted soldier. She was only 13 when she met the American soldier Henry W. Wolff when he was staying in their house during the war. During the day he stood at the artillery guns pointing towards Aachen in Germany. Directly after the war her family adopted his grave. Sidney gets a voice and a face through personal letters and pictures. Beautiful images of Limburg as well as of Sidneys’ hometown in the USA and vivid memories of the adopter of Henry Wolff, illustrated with special historical images. This documentary tells the story of 70 years grave adoption in Margraten. Click here for a short Promofilm. The documentary is 47 minutes. The dvd has English subtitles and is suitable for the USA. Price: € 15,95 forwarding-charges not included. You can order by clicking on the webshop at the bottom of this page. 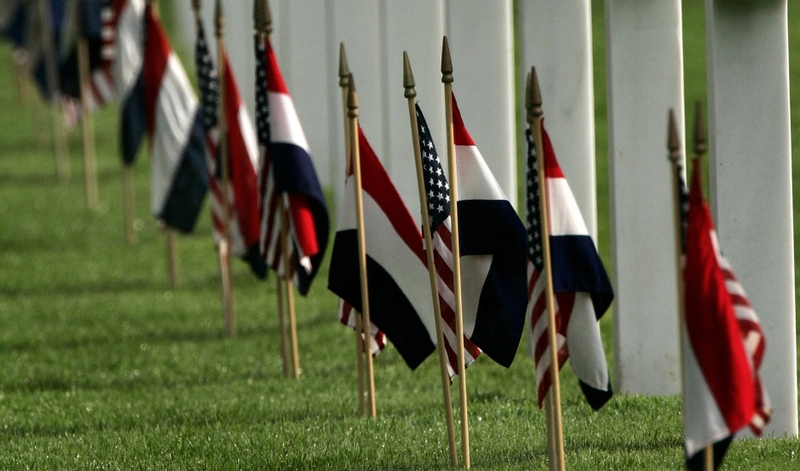 The film ‘Farmland of Margraten’ contains the story of the construction of the American military cemetery. It contains interviews with eyewitnesses and shows during 70 minutes stories and films from American archives. Dutch and English subtitles. Jefferson Wiggins, an Afro-American, tells about his experiences at the American cemetery in Margraten. In 1944 and 1945 he was responsible for digging the graves of military victims in Margraten and assisted in burying his countrymen. The book contains historical information about the segregation in the American Army. Janice Wiggins translated the book in English. Price: € 19,95 forwarding-charges not included. You can order the book by clicking on webshop at the bottom of this page.